Join us in Cairo on Monday, March 4th, 2019 at the Center for Learning and Teaching in Cairo’s Symposium event taking place at the American University in Cairo. The session will feature keynote speakers Alec Couros (@courosa) and Catherine Cronin (@catherinecronin). 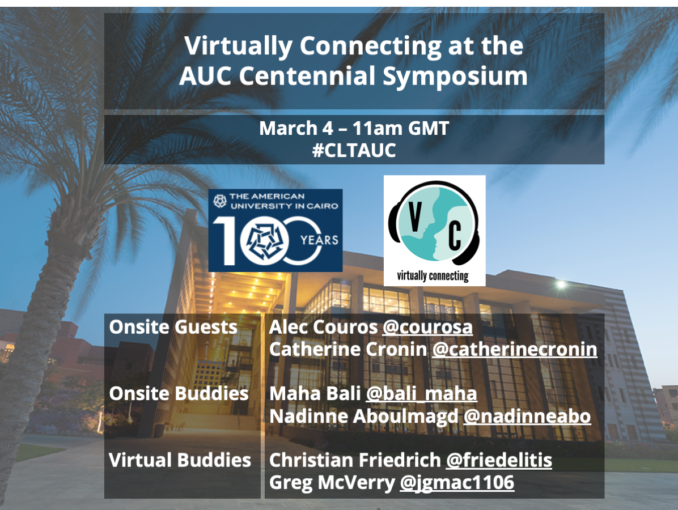 Our Virtually connecting session with take place with Catherine and Alec on Monday March 4th at 3:30pm Cairo time, with onsite buddies Maha Bali (@bali_maha) and Nadine Aboulmagd (@nadinneabo) and Virtual Buddies Christian Friedrich (@friedelitis) and Greg McVerry (@jgmac116). Please find below the link to watch the live or recorded session, and if you would like to join us, please tweet to @vconnecting on Twitter or leave a comment below. Please note that Virtually connecting sessions are spontaneous and sessions may start or end at slightly different times depending on sessions happening onsite.